Derma E Microdermabrasion Scrub Exfoliator is a salon skin treatment alternative. 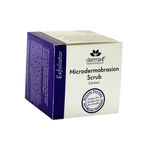 Derma E Microdermabrasion Scrub immediately improves your skin's appearance by utilizing a crystal blend system to remove dead skin cells in a safe and effective formula. Markedly diminishes the appearance of fine lines, wrinkles and acne scars. Retexturizes skin and leaves it silky smooth. Water aqua, stearic acid, stearyl alcohol, glyceryl stearate citrate, glyceryl stearate se, alumina, citrus aurantifolia lime oil, xanthan gum, carrageenan irish moss, volcanic sand pumice, citrus limon lemon peel oil, glycerin, vitis vinifera grape seed oil, purnus amygdalus dulcis sweet almond oil, organic simmondasia chinensis jojoba seed oil, citrus simensis sweet orange essential oil, tocopheryl acetate vitamin e, magnesium oxide dead sea salt, hydrated aluminum silicate kaolin clay, phenoxyethanol, ethylhexylglycerin, potassium cetyl phosphate, potassium sorbate.